Weimaraners (pronounced VI-Mer-Ron-Er) are a happy, affectionate and a high energy breed. They are highly intelligent, and if give the chance, are not afraid to use their intelligence for their own devices. 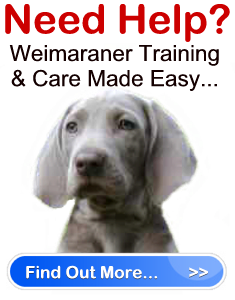 For this reason, the Weimaraner needs firm dominance training to develop into a well loved member of the family and community. The Weimaraner makes a wonderful guard dog, and can be quite protective of his territory. He has an excellent sense of smell, loves the outdoors and is by nature a hard worker. Weimaraners make ideal pets for the active individual or family. Weimaraners have been around since the 17 th century. Their breed was developed in Germany, and wasn’t recognized as an actual standard until the 20 th century. The first development of the breed was started by the nobility of the grand duchy of Weimar (also where the breed received their name). It is believed that Weimaraners were the result of breeding bloodhounds with a variety of other types of hunting dogs. This is likely why the Weimaraner has such an excellent sense of smell. When hunting large game was no longer popular in Germany, the Weimaraner was then used as a pointing dog. During this time, the breed also lost its importance among the nobility. Due to its lack of popularity, the breeding of Weimaraners was closely monitored and regulated. The result was that the breed did not surface anywhere outside of Germany until the 1930’s. Once Weimaraners were introduced in the U.S. and Britain, they were well received and have been used as sporting dogs, and as devoted family pets ever since. Are You Ready For Weimaraners? Weimaraners are beautiful dogs that grow to a height of 23 – 27 inches at the shoulders. They weigh anywhere from 70-86 pounds. Their average life span is 10 – 12 years, and overall they are a hearty breed without many hereditary health defects. The only health issues that need to be monitored in this dog are hip dysplasia and bloat. Being high energy dogs, Weimaraners require plenty of exercise including the freedom to run and daily walks (at least 2 walks per day for a minimum of 15 minutes). These dogs can live in the city, but are not ideal for apartments. As part of the Sporting and Gundog group, Weimaraners love the outdoors, and like to swim. However, the outdoors doesn’t always agree with them. Because they have a short coat, Weimaraners are extremely sensitive to hot and cold temperatures and shouldn’t be left outdoors in the dead of the summer or winter. Weimaraners are an extremely intelligent breed but are quite willful and have good memories. Therefore, they must receive proper obedience training and socialization, or they will walk all over their owner, and become overprotective and highly suspicious of strangers. The Weimaraner is an ideal watchdog and will protect his family. He is pretty good with children, but he is best suited to older and more responsible children. The main reason is due to the dog’s high energy. Small children can easily be knocked down by the dog. The Weimaraner breed is friendly towards his fellow canines and will tolerate other family pets such as cats if brought up with them. That being said, the Weimaraner should not be trusted around rodents. This ghost gray dog is easy to care for. All he needs is an occasional dry shampoo and brushing to stay in tip-top shape. His coat does shed. Without a doubt, the Weimaraner is a wonderful dog that enjoys an active lifestyle and is very devoted to his owners. He loves people, enjoys company, and likes to be included in everything. Therefore, it is vital that if you own a Weimaraner that you make him a huge part of your daily life. If you leave this dog alone too much, he will become quite unhappy and exceptionally destructive. Weimaraners are not a good choice for first time dog owners, and require the attention and care of someone who has experience and is willing to spend plenty of time training and nurturing the dog.